Evan is a kayaking nerd. He loves to paddle, currently works at a kayak shop, and spends his free days in whitewater. Since I met him, he's been talking up the sport to me. Finally, for my birthday, he bought me a used Wavesport EZG playboat. Next step, learning the tricks of the trade for whitewater kayaking. The first thing Evan is teaching me is how to roll. It's the skill that will help all kayakers feel safe challenging themselves in whitewater. It is the ability to roll yourself and your boat back upright if you flip over while kayaking. He's been teaching me for about a month now, but given our busy schedules, we've only been out to practice on the water twice. 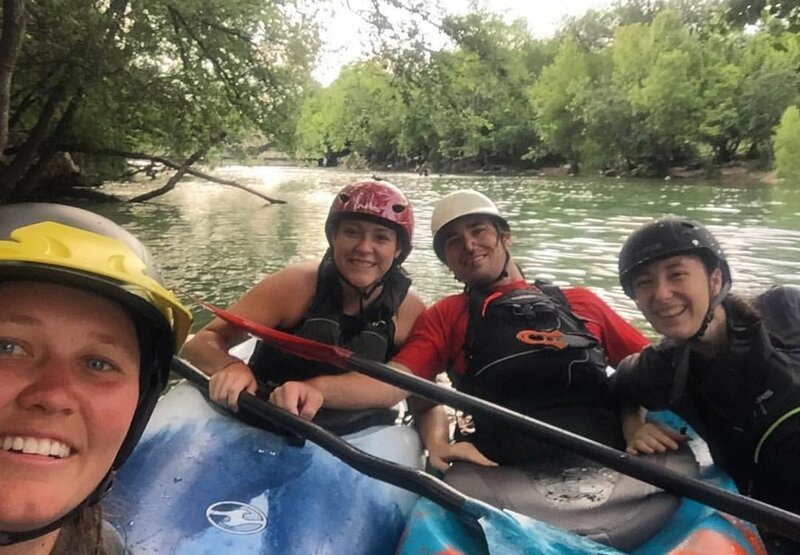 The most recent adventure was to Barton Creek with a few other friends. Photo 1 by Deanna: Practicing on Barton Creek. We had trouble all fitting in the photo. Photo 2 by Evan: First time in the new boat!